One day when my children were young and couldn’t sit still I commented on how they were acting like they had “ants in their pants”. I didn’t think much about the phrase until my then preschool aged daughter literally checked her pants for ants! This is when I realized that children don’t always interpret the true meaning behind some of the common phrases that have been around forever; they actually interpret them literally. 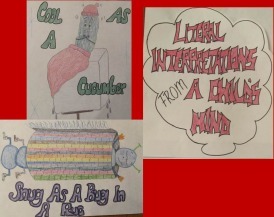 This lesson has students illustrating common phrases based on how a preschooler might interpret or visualize the phrase literally. 11.4.12 A Analyze current research on existing theories in child development and its impact on parenting(e.g., Piaget, Erikson and prior findings versus new brain development research). 11.4.12 E Identify practices that develop the child’s imagination, creativity and reading and writing skills though literature. Share the above “ants in the pants” story with students along with the following bell ringer on the board or screen for students to answer: Do children and adults think the same way? Give an example to support your response. Share and discuss students ideas. Discuss that as parents and caregivers our thinking is advanced enough to understand the true meaning of these age-old phrases, but we have to think about the intellectual development of little ones. According to Piaget, preschool children are beginning the preoperational stage of their intellectual development. That means that children are beginning to have greater language comprehension skills and are more expressive. However, we must remember that some words and phrases have more than one meaning and this can confuse children and cause them to interpret them literally. In order to understand these literal interpretations a person has to understand abstract thinking and be able to think symbolically. Read the book “The King Who Rained” by Fred Gwynne YouTube style to help understand what a young child might interpret and visualize. Now it’s the student’s turn to choose a phrase to write a scenario about and illustrate the way a preschool child might interpret and visualize it. If you have access to Preschool or Kindergarten aged classrooms it might be interesting to have teens say the phrase to children and have the children draw and illustrate what comes to mind when they hear the phrase. This could be made into a book and donated back to the children’s class.